It all started back in 1967 when Sicilian born Giovanni Smecca decided to move to Galveston, Texas from Paterson, New Jersey after hearing Glen Campbell’s famous “Galveston” during a card game. Giovanni always dreamed of being a professional fisherman, so he decided to give it a shot and made the drive to Galveston. Unfortunately, after battles of sea sickness, Giovanni quickly decided that the fish business wasn’t for him... Heartbroken, Giovanni was about to move back to New Jersey when he met Mario Bonaccorso, who at the time was trying to open a pizzeria. 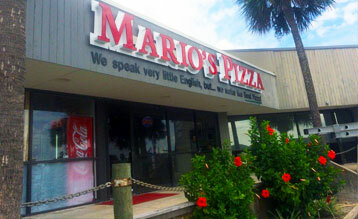 The two became great friends, and together, these two young Italian entrepreneurs started Mario’s Flying Pizza and brought the “pizza pie” to Galveston Island! 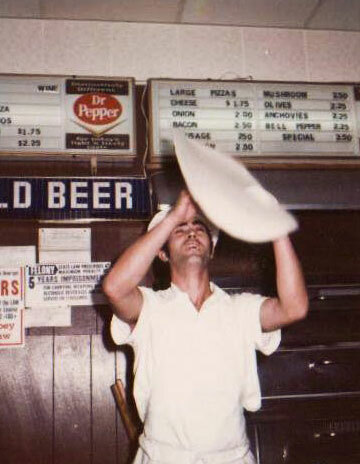 Today, we are still family owned and operated and are considered a delightful, neighborhood restaurant with a friendly, relaxed atmosphere. We serve a wide variety of Italian cuisine and New York style pizza and strive to use fresh, seasonal, ingredients wherever possible, so come on in, sit back, relax, and enjoy a wonderful meal and a nice glass of wine at Mario’s Ristorante! OUR LOCATIONSCovering all of Galveston and Tiki Island! Our MenuWe deliver everything you see here! StartersStart off with one or more of our tasty starters! Freshly baked Italian bread drizzled with olive oil, toasted and topped with diced Roma tomatoes, garlic,fresh basil, green onions and sprinkled with parmesan cheese. A combination of fried mozzarella, fried zucchini and fried mushrooms.Served with a side of tomato sauce and ranch dressing. Italian breaded fried mushrooms served with ranch dressing . Italian breaded fried cheese stuffed ravioli served with tomato sauce . Italian breaded fried zucchini served with ranch dressing . Seafood stuffed mushroom caps served in a creamy parmesan cheese sauce. Shrimp sauteed in a lemon, garlic white wine sauce. An Italian sub with ham,salami,provolone cheese,lettuce,tomatoes,and red onions and drizzled with olive oil and vinegar. Thinly sliced eggplant fried and topped with tomato sauce,mozzarella, and parmesan cheese then baked on a french loaf. Served with fries or chips. Grilled chicken breast,lettuce,tomato,red onions,provolone cheese and mayonnaise served on a french loaf.Served with fries or chips. A classic Italian sandwich filled with Italian sausage,peppers and onions,served on a french loaf.Served with fries or chips. Fried popcorn shrimp fried and served on a french loaf with lettuce,tomato and tartar sauce.Served with fries or chips. Veal cutlet fried and topped with meat sauce,mozzarella, and parmesan cheese then baked on a french loaf. Served with fries or chips. Simple but delicious. Topped with our house made signature pizza sauce made from mouth watering juicy plum tomatoes and topped with freshly graded mozzarella cheese. PastasAdd a Garden Salad or a Cup of Soup to any Pasta dish for just $1.95! Spaghetti tossed with our hearty meat sauce and served with 2 jumbo homemade meatballs. Pasta sheets layered with beef and ricotta cheese topped with our hearty meatsauce and mozzarella cheese and oven baked. Fettucine noodles tossed in our creamy parmesan cheese sauce. Fettucine noodles tossed in our creamy Alfredo sauce and topped with sliced grilled chicken breast. Fettucine noodles tossed in our creamy Alfredo sauce with shrimp,crab and crawfish. Sauteed shrimp tossed with fettuccine noodles and our creamy parmesan cheese sauce. Spaghetti noodles tossed in our hearty marinara sauce with mushrooms, Italian sausage and 1 jumbo meatball. Spaghetti noodles tossed in a garlic and olive oil sauce. Angel hair pasta tossed with shrimp and crawfish in a creamy lobster sauce and topped with jumbo lump crab meat. Ziti noodles mixed with ricotta cheese and tomato sauce topped with mozzarella and parmesan cheese then oven baked. Jumbo ricotta stuffed ravioli topped with tomato sauce. Ricotta and beef stuffed jumbo ravioli topped with our hearty meatsauce. Lobster filled ravioli covered in a creamy lobster sauce,topped with crawfish tails,spinach and jumbo lump crabmeat. Spaghetti with sliced grilled chicken tossed in a garlic and olive oil sauce with roasted red peppers,artichoke hearts and kalamata olives. Ricotta cheese stuffed pasta rolls topped with tomato sauce, mozzarella and parmesan cheese and oven baked. Ziti noodles tossed with a medly of fresh vegetables in our garlic and olive oil sauce. Cheese stuffed tortellini pasta tossed in a creamy parmesan cheese sauce with ham,green onions,mushrooms and peas. Angel hair pasta tossed in a hearty marinara sauce. Linguine noodles and fresh shelled clams tossed in a garlic butter sauce. Penne pasta tossed in a creamy vodka pink sauce. EntreesAdd a Garden Salad or a Cup of Soup to any Entree for just $1.95! Seafood, spinach and capellini stuffed chicken breast topped with a lobster sauce and crawfish tails. Served with sauteed veggies. Floured chicken breast sauteed in a lemon butter and white wine sauce. Served with a side of pasta. Chicken breast tossed in italian bread crumbs and fried, topped with tomato sauce and mozzarella cheese then baked. Served with a side of pasta. Chicken breast sauteed with artichoke hearts, and capers in a lemon butter sauce. Served with a side of pasta. Chicken breast stuffed with prosciutto ham,and cheese in a mushroom Marsala wine sauce. Served with a side of pasta. Chicken breast sauteed in a mushroom Marsala wine sauce. Served with a side of pasta. Jumbo fried shrimp topped with our tomato sauce and mozzarella cheese then oven baked. Served with a side of pasta. 4 Seafood stuffed jumbo shrimp in our homemade lobster sauce, served over fettuccine noodles. Veal cutlet floured and pan fried. Served with a side of fresh roma tomatoes and julienne sliced red onions or a side of pasta. Floured veal cutlet sauteed in a lemon butter and white wine sauce. Served with a side of pasta. Veal cutlet sauteed with artichoke hearts, and capers in a lemon butter sauce. Served with a side of pasta. Veal cutlet sauteed in a mushroom Marsala wine sauce. Served with a side of pasta. Veal cutlet tossed in italian bread crumbs and fried, topped with meat sauce and mozzarella cheese then baked. Served with a side of pasta. Veal cutlet stuffed with prosciutto ham,and cheese in a mushroom Marsala wine sauce. Served with a side of pasta. Sliced grilled chicken breast served on top of a bed of fettuccine noodles tossed in a light tomato sauce with bell peppers,onions and mushrooms. Spaghetti noodles tossed in our meat sauce with 1 jumbo meatball. Spaghetti noodles tossed in our hearty meat sauce. Spaghetti noodles tossed in our tomato sauce. Spaghetti noodles tossed in a butter sauce and parmesan cheese. Fried chicken strips served fries. Mini beef corn dogs served with fries. Fettuccine noodle tossed in our creamy parmesan cheese sauce. Ditalini pasta tossed with a butter sauce and parmesan cheese. Party TraysAll Party Trays require a 4 hour notice. Half Trays feed approximately 10 guests. Full Trays feed approximately 20 guests. Join our eClub and receive a FREE appetizer! 2016. 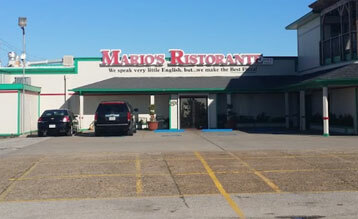 Mario's Ristorante. All rights reserved.